A Cappuccino Cupcake for You... Not! Nope, it’s not milk… it’s black soy milk! 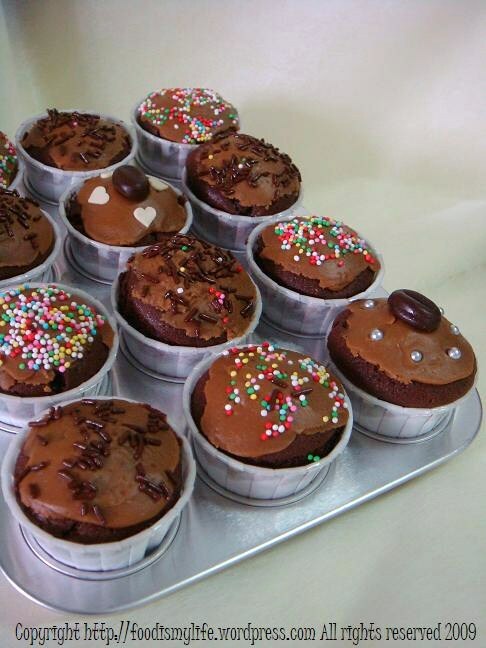 But that’s not the main point, the main point is the cupcakes! Yes, I know, it’s been a while. It’s been a long while since I last fished out my recipe book and start finding recipes to make; it’s been a damn long while since I last took out all the baking equipment and start measuring the flour, the butter and the sugar; it’s been a long while since I last baked cupcakes… Well… not exactly, but yea, I have to admit I have not been baking for quite some time. Actually, I intended to bake a cheesecake, but due to certain unforeseen yet thankful circumstances, I have to postpone my cheesecake-baking session to another day – hopefully next week. 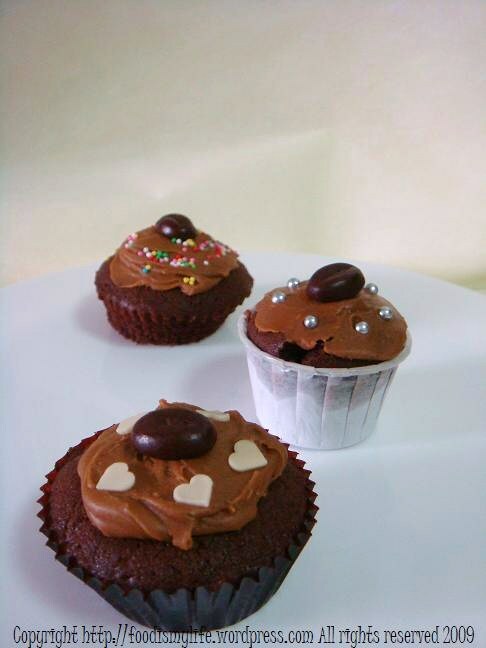 So today all I managed to whip up is these little cupcakes, which, as usual, is taken from one of the 500 series. 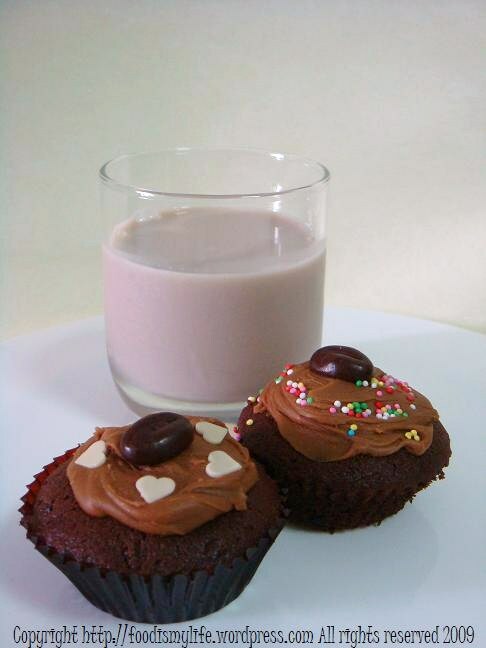 The chocolate cupcakes are light and fluffy and are already good on their own. The icing… I must say it’s really one of a kind. I’ve never made an icing that requires the melting of white chocolate. In the cookbook itself, the icing is actually much paler in colour, almost creamy white, but mine remains brown… I made only half of the icing that the recipe calls for, as I know that some will prefer their cupcakes plain. I only managed to whisk half of the icing sugar – if I whisked in any more, I think it’ll become really tough and un-spreadable. Combine all the cupcake ingredients except for chocolate chips in a large bowl and beat on medium speed for 3 minutes with an electric whisk till smooth, scraping the sides every minute. Turn down the speed to low and add in the chocolate chips, blending for another extra 30 seconds. Divide the mixture between the cases and bake for 15 minutes until well-risen and golden brown. Remove from the oven and cool for 5 minutes. Transfer to a wire rack to cool completely. Put the white chocolate chips and coffee in a heatproof bowl. Set it over a pan of simmering water and stir constantly, until the chocolate has melted. This is kind of tricky as white chocolate are pretty difficult to melt, but just keep stirring! And make sure that absolutely no water comes into contact with the chocolate. Remove the bowl from the heat and vigourously whisk in the icing sugar, gradually at a time, till desired consistency has reached. Spread the icing over the cupcakes and decorate away! Baking is an activity that helps me to relax, and at the same time, pulling me away from the “reality” and putting me into a world where I’m the queen (laughs) and no one will disturb me in whatever I do. Some people find baking scary – some of my friends told me they always make a mess out of the kitchen. I do, too. Always accidentally spilling flour or cocoa powder everywhere; causing a flour storm whenever I whisk in the flour; over-baking the cookies or cupcakes… what’s the worse kitchen disaster you’ve ever created/witnessed? Hmm… which one shall I eat next? I got those cup cake cases at my local bakeware store. I’m not sure where you can get it online though… sorry! Can you tell me where I can access the white paper cup cake cases with the folded paper under the rim.